A simple solution for basic RF safety measurements, the HI-2200 RF Survey Meter provides a compact measurement system including interchangeable probes. 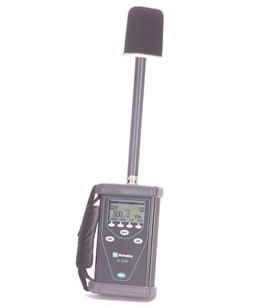 The HI-2200 RF Survey Meter is a lightweight, easy to hold instrument for less accessible measurement locations such as towers and ladder access situations. The display module has easy to use Spatial and Temporal Averaging on a large LCD display. Additional features include Data Logging capability, User Selectable Readout Units, and Adjustable Alarm Threshold, and an RS-232 Data Interface. Health Care Facilities: Concerns regarding medical personnel exposure and potential electromagnetic interference are more easily addressed with the HI-2200 RF Survey Meter. Safety and biomedical personnel can now have easy access to measurement tools for monitoring RF exposure and equipment interference issues. Industrial: A safe workplace for employees is an important responsibility for all companies. EMF employee exposure safety guidelines now exist in most countries. IEEE, ICNIRP, and national standards provide guidelines for worker RF exposure.